Hi all, thanks for swinging by. 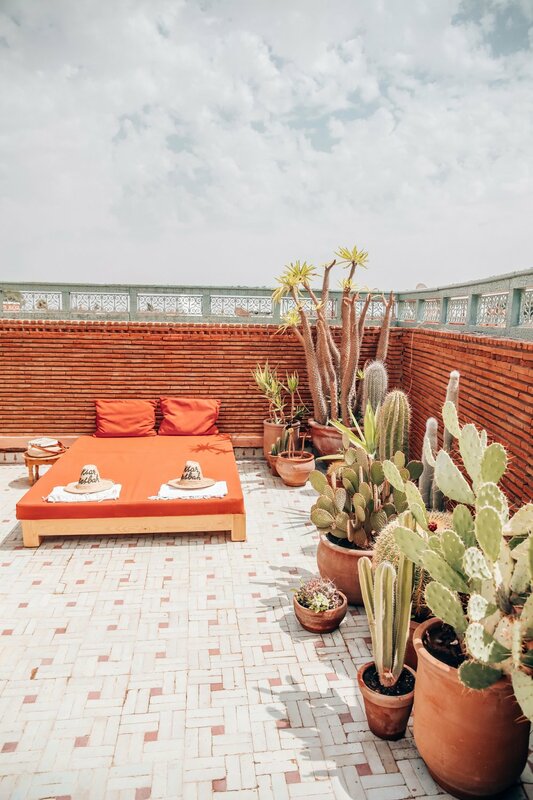 As it was my fifth visit to Marrakech this year, I thought it time to write a destination post on it. I love everything about Marrakech, the buzz, streets, souks, food, noises - EVERYTHING! 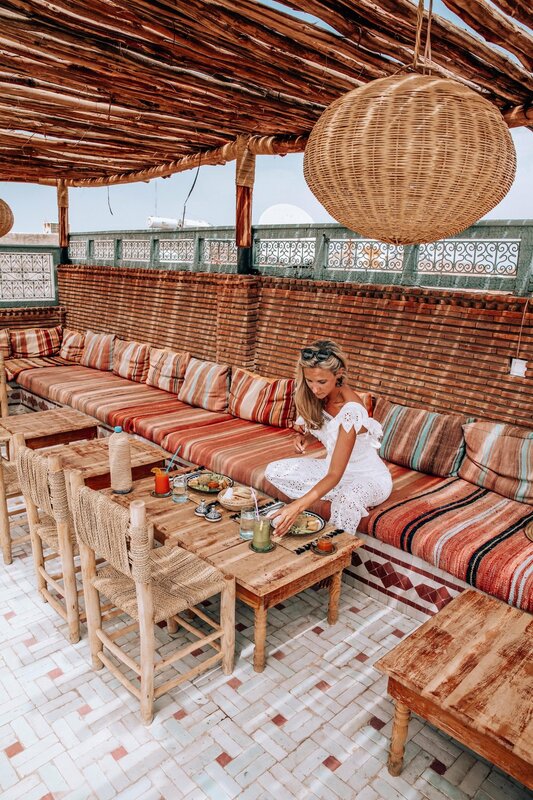 Over the years, I have collected so many Moroccan pieces to put into my home and forever have that feeling of wanting more! Flying to Marrakech is very straight forward from Gatwick Airport, it’s a direct flight lasting 3.5 hours. 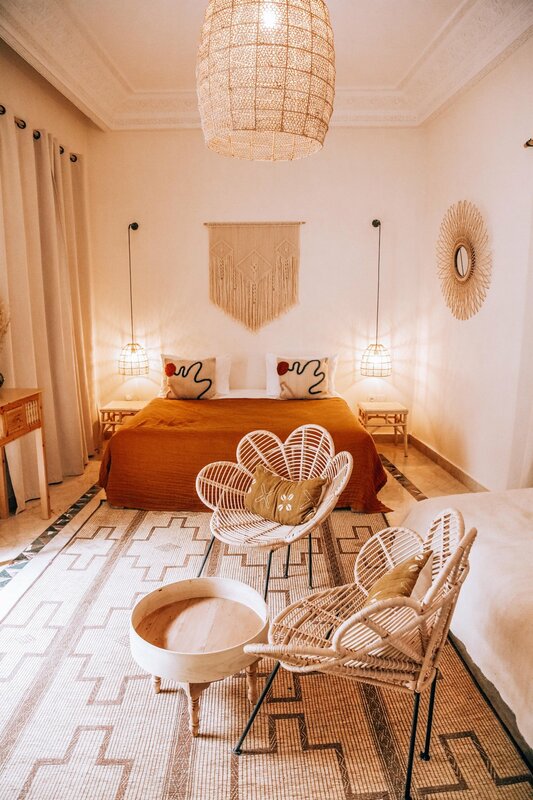 There is no time difference, no visas needed and the airport is situated a 30 minute drive away from the the center of Marrakech. 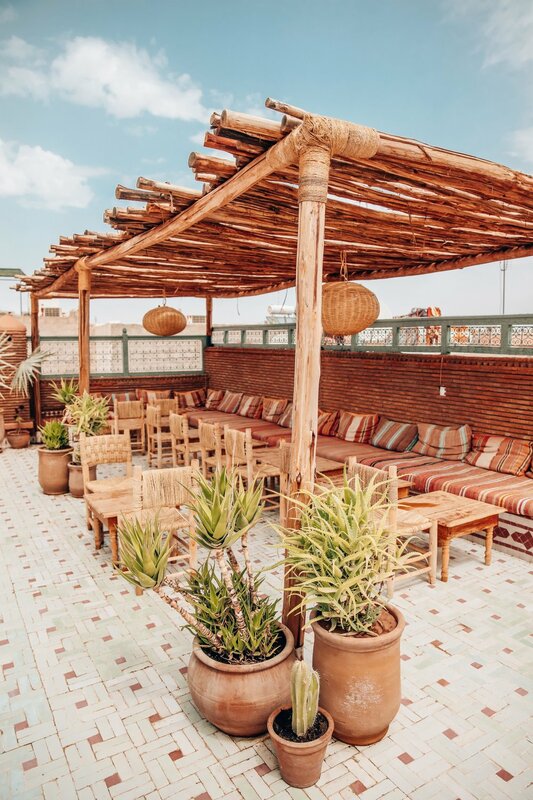 Their currency is Morrocan dirham and they don’t allow you to bring it into the country, however if you have a currency card like Revolut or a Monza - you can top this up and get cash out once there (cash machines available). 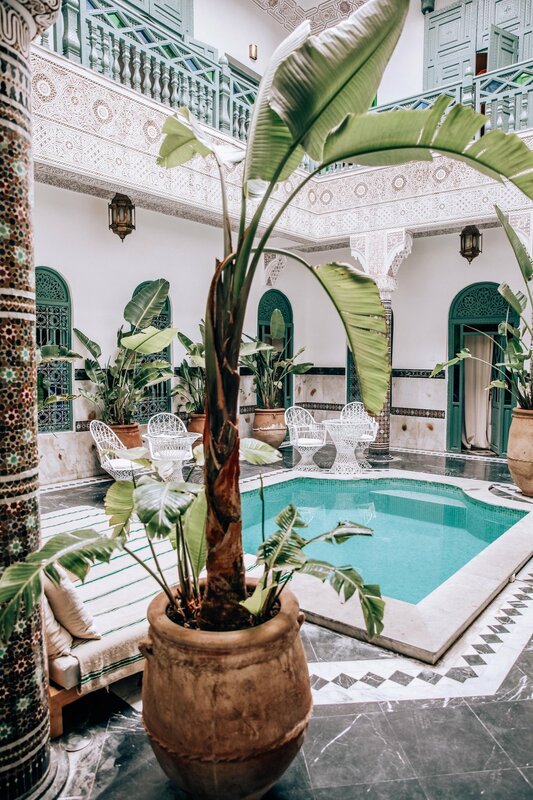 Having stayed in both villas, hotels and Riads over the years, I highly recommend before visiting, working out what your priorities are from your trip. If you’re staying for 5-7 days and want pool, sunbathing, relaxing and a bit of shopping - then I suggest a villa or hotel outside of the wall. 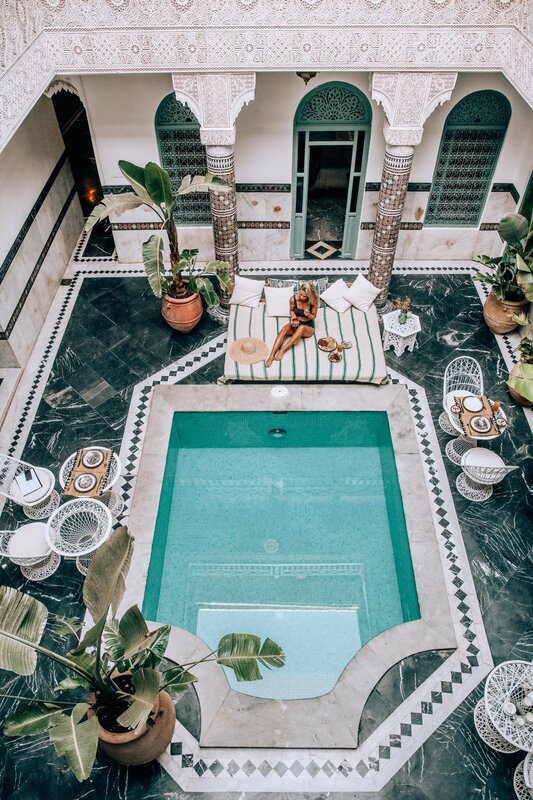 However, if your priority is shopping and wandering with only 2-4 days to spare, then I recommend staying in a Riad inside the wall - making it easy to access the souks in the Medina, night and day! We stayed in Ksar Kasbah and Riad Dar Ten - both Riads were inside the wall. Ksar Kasbah was a little further away from the souks but it was incredibly beautiful, whilst Riad Dar Ten was situated in the BEST location - but unfortunately didn’t have that same high standard. Don’t buy from the first stall you see in the Souks, I say this because there will be the same rug or bowl - 100 times over! Everything you buy you need to barter for. They go in high, you go in low and 10 minutes later, you eventually meet somewhere in the middle! Never go with the first price you get given, make a hard bargain. Go into a shop knowing what £5 is worth in Moroccan dirham - it’s around 61 dirham. Starting at 50 dirham is a good point for small china. I often find walking away gets their attention, so make your final price and walk away - they’ll come chasing after you. If you don’t get the deal you want, move onto the next one.. as I say - they all sell the same thing! Download ‘Marrakech’ onto google maps offline and pin your Riad or hotel. Be prepared to get lost! Get vaccinated for Hepatitis A before travelling - there are lots of ferrel dogs. Apparently tap water is filtered, but I don’t recommend drinking it either way. I got very sick from a salad on Jemaa el-Fnaa square - so I would avoid if you can. Choose where you eat meat carefully, I wouldn’t recommend eating it off the street (again personally view). Thanks for having a read, only a short one! Enjoy your time there and make sure you buy LOTS - you’ll regret it when you get home if you don’t. I always go with an empty suitcase, no joke!